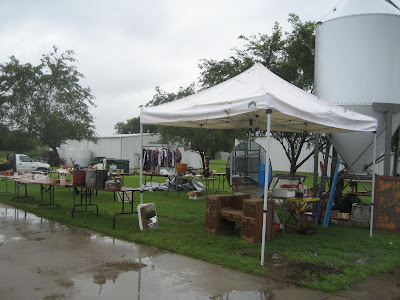 Saturday brought May showers to the Poetry Community Yard Sale. This field was supposed to be filled with buyers and sellers, come rain or shine. But, not everyone wanted to get soaked! We had 3 sellers who came and sold out of their vehicles. Talk about Tailgate Parties and Trunk Shows, we had 'em! A few folks did come out and take advantage of our Rainy Day Sale. Bargains were to be had! Mayron came out and set up some goodies. Great displaying in the midst of the storm! She took advantage of this slotted piece for showing off all of her smalls. Thank you, my friend, Mayron for coming out and playing with me! My regret? I didn't take pictures of all the brave troopers who came out and shopped! Ready for some name dropping? Well, Maggie from The Veranda cheated and came out Friday, when it was dry. 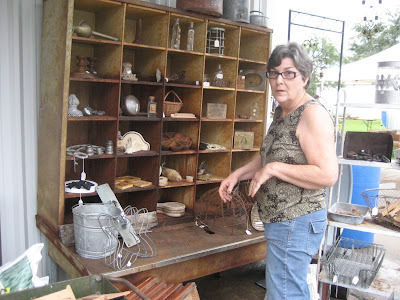 Theresa from Garden Antqs Vintage made the drive from Huntsville to Poetry with her hubby, mom and baby boy. Liz and Fran from Terrell made it. Valarie and Tim came from McKinney. So nice to meet y'all! Diane from Pilot Point came over for some shopping while her hubby was in a fishing tournament at a local lake. I'm sorry I didn't get her blog name. Diane, shout out so we can check out your blog, would ya? It was busy sometimes, so I may have missed someone. If so, I am sorry. Several locals came out, as well. So, we had a good time, in spite of Mother Nature. Couldn't make it yesterday? Good news! We're gonna do it again this coming Saturday, May 23. You are invited to come set up and sell, or come buy to your heart's content. I'll be getting new merchandise into Primitiques and many more sellers will be set up in the yard, for your buying pleasures. I went a little crazy with my red dot, half price sale in the store. My bet? I'll do it again. We have red tags all over the store and red dots on the front porch. I'm ready to make room for more new merchandise! Let me know if you want to come sell and we can talk details. ps. I am going to read over all of your recommendations (from post 198) and choose my new magazine subscription tonight. I will make my choice soley based on your recommendation. No research. Just trust. My 200th post will reveal the winner of a 1 year subscription. pps. Debbie at Talking Trash's birthday is this Tuesday. Be sure to drop by this week to wish her well! Hey girl did they sell that dresser? My Mom is looking for one like this. If they haven't sold it how much were they wanting. Wish I could've been there~work was slow and boring! 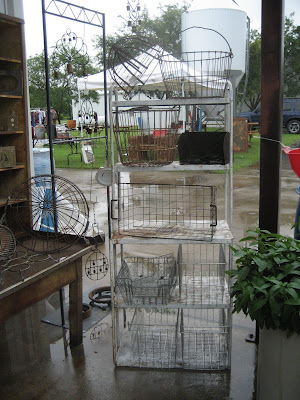 So sorry it rained on ya'lls sale but so enjoyed coming by and visiting with ya'll. Hoping for better weather next weekend. 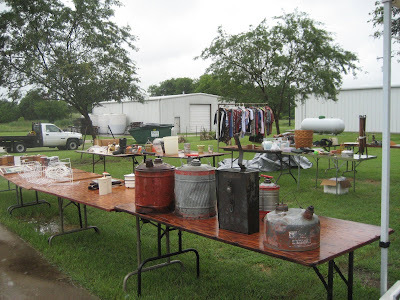 Rain or shine, it looks like you had some great stuff! Sorry you got rained on! Hope next Sat. is better. hEY mINDY! So nice to meet ya! Will probably be back this week-end! Hope next week is a winner! Y'all sure got some Texas Try about you! I'll keep my fingers crossed for next weekend and blue skies.